Shokti Leadership Coaching works with executives and business professionals who want to increase their leadership impact. We are a network of Integral Coaches® led by Srirupa Dasgupta, principal. We are lifelong students of the human experience and dedicated to making the world a better place through our work. Through our Integral Coaching® program, our clients are able to integrate and sustain new behaviors and cultivate new habits to increase their impact and contribution to their organization’s bottom line. We work with the whole person, taking into consideration their physical and emotional condition, as well as the cultural context and physical environment in which they live and work. Our coaching methodology integrates psychology, linguistics, physiology, neuroscience, ontology, behavioral science, philosophy, and many other disciplines to offer unsurpassed results to individuals and organizations. Srirupa Dasgupta, certified Integral Coach® and principal of Shokti Leadership Coaching, works with executives and business professionals who want to increase their leadership impact. Sri brings to her leadership coaching practice a deep understanding of the leader’s role in building successful organizations. While working from a place of authenticity and compassion, Sri helps executives and managers at all levels increase their capacity to stay focused on what matters most, take on new and challenging responsibilities confidently, and build high-performing teams that deliver what they promise. Prior to starting her coaching practice, Sri worked in the corporate sector for 14 years. She rose through the ranks of the healthcare software division of McKesson Corporation to become director of development and technical services. At Lucent Technologies, Sri managed a global team with members in all continents. A resident of Lancaster, Pa., Sri founded Upohar, a catering company whose social mission is to generate employment opportunities for resettled refugees. The business has garnered local publicity for its philanthropic business model, which Sri has presented at various leadership events in the community. Sri has been providing leadership coaching to business executives for more than 10 years. Past clients include senior mangers, directors and executives from Lonza, Charles Schwab & Co., TIBCO Software Inc. and Women’s Initiative for Self Employment. 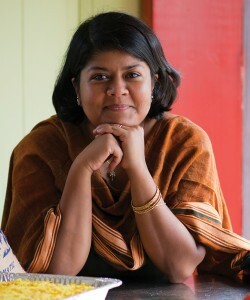 Sri graduated from Smith College with a bachelor’s degree in computer science and studio art. She currently serves on the Board of ASSETS in Lancaster, Pa. In the past, she has served as adjunct faculty at New Ventures West, a coach-training school based in San Francisco, California. She has also served as President of Silicon Valley Coach Federation (SVCF) from 2004–2006 and was Chair of the Ambassadors’ Club at the San Francisco Chamber of Commerce in 2005. A dynamic speaker, Sri regularly presented business seminars at the San Francisco Small Business Administration (SBA). She is the author of Effortless Networking: Everyday Wisdom to Transform Your Business and Life. Sri and her husband are raising a multicultural, multifaith and multilingual family. She loves dancing Argentine tango. And gardening helps her remember that not everything can be hastened.